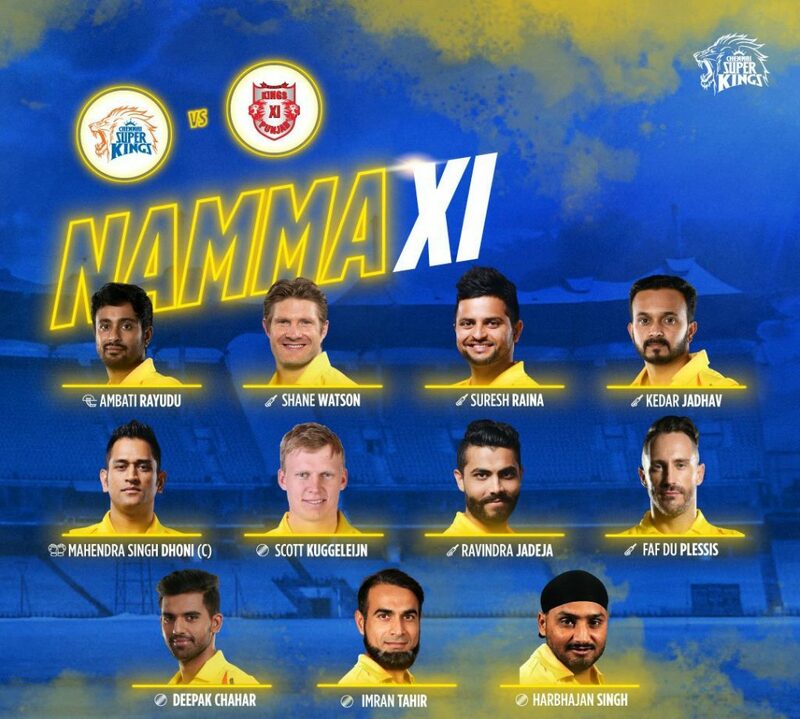 After winning the toss and electing to bat first, the Chennai openers made a fantastic beginning as the duo of Faf du Plessis and Shane Watson added 56 runs for the opening stand, before Ravichandran Ashwin dismissed the former for 26. Suresh Raina along with Du Plessis put on 44 runs for the 2nd wicket, before the latter playing his first match of this years IPL was out for a well compiled half century. Ashwin in the very next ball dismissed Raina for a scratchy 17. Mahendra Singh Dhoni and Ambati Rayudu added an unbeaten 60 runs for the 4th wicket as Chennai Super Kings in the final three overs finished with a flourish by scoring 44 runs, to take their side to a competitive score of 160/3 in their allotted 20 overs. R Ashwin was Punjab’s best bowler as he claimed 3 wickets for 23 runs. Chasing a target of 161, Kings XI Punjab got off to a poor start as Chris Gayle and Mayank Agarwal were dismissed in cheaply by Harbhajan Singh in the 2nd over. KL Rahul and Sarfaraz Khan anchored the innings by adding a valuable 110 runs for the second wicket, before the former was caught in the deep by Ravi Jadeja off Scott Kuggelein for 55 runs. Deepak Chahar ended Kings XI hopes by dismissing David Miller,as the visitors were restricted to 138/5, giving Chennai their fourth victory of the tournament. Harbhajan Singh and Kuggelein bagged 2 wickets each. The 38 year old Harbhajan was declared the Player of the Match.